Sheba is the mama of many kittens from the Annandale colony & who knows how many of the cats. 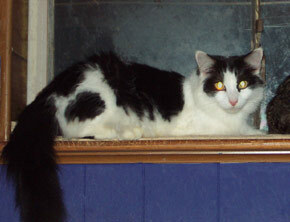 She was very hard to capture & had 2 litters in the process, to our consternation. Everyone from both litters came to CR!FR, fortunately & the youngest litter went to a cat rescue-active vet who offered to help find them homes. The older litter is here at CR!FR because they're not very tame. Sheba was actually a little friendly when she arrived. Being reunited with her family & friends must have been nice. Her former litter got along great with their new little siblings. It was great to be able to pet & sometimes hold this beautiful, silky gal. But somewhere along the line she changed her mind & decided to keep to herself. We're so glad we got Sheba, after a year of persistence. She was keeping that colony going (almost) single-handedly. She was also quite thin under all that fluff. Now she's filled out a bit & enjoys laying in the hay on the porch & sleeping on a shelf downstairs.